This looks very much like a violin but it sounds very much like someone abusing a family of cats. 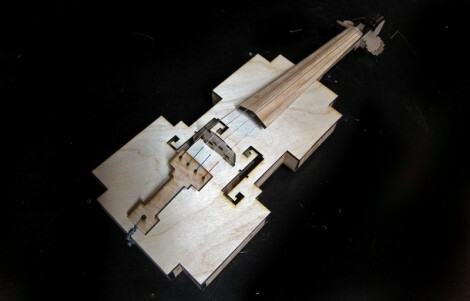 [Ranjit] came with the idea of building a violin using laser cut parts. It doesn’t follow the normal curved shape we’re used to seeing with string instruments. This is because the parts were all cut from flat stock, including the sides of the instrument. The boxy shape that resulted invokes visions of early video game objects and is why this is called the 8-bit violin. After the break you can see a video of [Bre Pettis] playing the laser-cut instrument. It’s pretty bad, but not in that five-year-old picking up an instrument for the first time sort of way. Yes the best violinists spend a lifetime honing their craft, but they also play on instruments hand carved by master Luthiers who also spend a lifetime perfecting their skills. Don’t get us wrong though, we think it’s just as much fun as that 3D printed guitar. A violin’s shape is kinda the quintesence of the thing..This is a shoebox with stings.. The shape acts as a resonance chamber. Removing the arch removes the warmth of the sound. The result isn’t as bad as I expected; I expected an even more “tin-y” sound to it. If it was used as a base for an electric violin, those problems would go away, but then I’d suggest leaving the body as a single solid piece. The proportions being taken from a violin, the intonation issues you hear are the player, not the instrument — but that could be caused by him needing to get used to the flat fingerboard. Could the arches be lazer cut? I know the curve in the ribs and the side should be able to be, but not sure if you could “ream” the top and back to get the right arch and thickness (at least with todays off-the-shelf technologies). I’ve been playing mine craft to much, this doesn’t help lol. now there’s an idea! i’mma hafta make me a minecraft violin! At first glance, I thought it was just a 4-bit violin, but still a great accomplishment! how long before someone remixes motzart & matlab to produce a wind instrument based on formula-derived volumes and shapes? I bet someone will post one on shapeways before I do, rats. Intersting. I’m not sure those are the right strings. They look like steel or something… Violin strings are .usually. heavier and wound. Like the D and G string on an electric bass. I wouldn’t mind putting one of these together just to hear it with the proper strings on it. And that playing ain’t half bad. Sometimes it’s tricky putting together performances and documenting them on the quick. From what I’ve read of violins, the placement of hte bridge itself can be infinitely finicky. There was also a ukuele laser cut model out there, no? THe violin body has two primary resonances: the walls and the contained airspace. The contained airspace is the easiest to vary, given a parametric model, such as this lasercut demonstration. Doubling the height will lower its resonance one octave. You can adjust for your favorite note with various other heights. If you have a lasercutter, or some kind of standard set of vertical tiles, you can experiment with different instrument thickness to hit the desired resonant note. That will also change the body resonance somewhat, but not as much. This is because the body res is also dependent, HIGHLY on bridge placement. Having a variable bridge in the design will be a huge boon. Has anyone seen if this design has an easily movable bridge? Also, when doing bridge resonances don’t forget to experiment with “bass bars.” These are strips o wood placed strategically on flat surfaces to selectively add resonances. In normal violins/fiddles, the body and airspace are tuned to the lowest two strings for maximum amplitude. The bridge and placement of the digital f-holes will be the most important features to consider… after the body resonance is solved. and good strings are put on there. My fave instrument is the cello…. Hey! I’m the designer of the 8-bit violin. I’m a bit late, but I just found this post with a lot of smart comments. Frits: I agree that this isn’t a serious violin, just a fun experiment. Jeremy: I considered cutting an arched top as a number of laminated cross-sections, but I decided to go with the flat top because it was easier and more in the 8-bit spirit. I’m sure the V-shaped fingerboard is an impediment to an experienced player. Noah: the strings are a set of cheap steel student strings I got on ebay. The bridge is a separate piece, and movable, but the sound post is glued in place. There is a bass bar, but it’s not carefully tuned. I’d love to make a cello but our laser cutter’s not big enough! If you have any questions, feel free to ask here or on moonmilk.com.